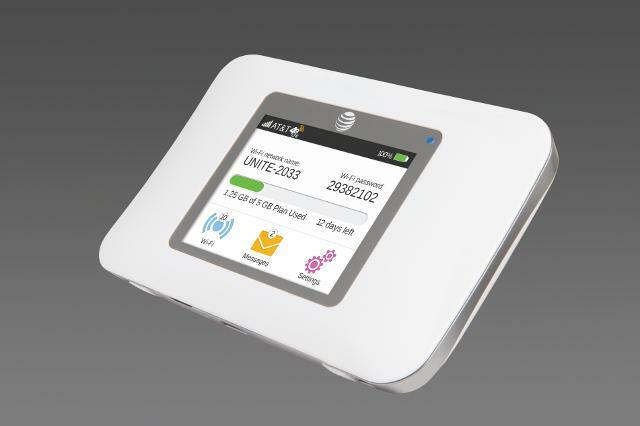 AT&T announced its latest 4G mobile hotspot on Friday, the AT&T Unite, made by Sierra Wireless. The device features a 2.4-inch touchscreen display and allows up to 10 other Wi-Fi devices to connect and share a mobile data connection at once. In other words, you and your pals can all surf the web or use tablets off of a single data connection. There’s even an on-screen meter to let you know when you’re about to hit your monthly allotment. AT&T did not announce pricing or a release date for the Unite, although we expect it will be available in the coming weeks.